Gasoline prices heading into Memorial Day weekend average $2.40 per gallon (gal) nationally, up from last year's price of $2.30/gal. Despite the year-over-year increase, 2017 marks the second-lowest price ahead of the Memorial Day weekend since 2009, when the national average price of retail regular gasoline was $2.31/gal. Relatively low crude oil spot prices, weaker year-over-year gasoline demand, and high gasoline inventories have contributed to relatively low gasoline prices. 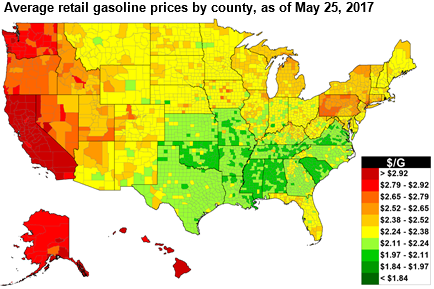 Retail gasoline prices vary significantly within the United States because of regional supply and demand balances, gasoline specification requirements, and taxes. The Gulf Coast (Petroleum Administration for Defense District, or PADD, 3), which has approximately 50% of U.S. refining capacity and produces more gasoline than it consumes, typically has the lowest retail gasoline prices in the country. West Coast (PADD 5) retail gasoline prices are often above the average U.S. price because of the region's tight supply and demand balance, isolation from additional supply sources, and gasoline specifications that are more costly to meet. Average Gulf Coast and West Coast prices are, respectively, 25 cents/gal below and 53 cent/gal above the national average price. Through May 22, U.S. regular gasoline prices, as measured in EIA's weekly retail survey, have averaged $2.36/gal in 2017. EIA expects the 2017 summer season (April through September) gasoline price to average $2.39/gal, 16 cents higher than last summer. On an annual basis, U.S. regular gasoline prices are forecast to average $2.34/gal in 2017 and $2.45/gal in 2018.